Sharp has announced a launch date for its record-breaking range of ultra-slim LCD TVs in Europe. Don't get too excited just yet though - if you're thinking of grabbing one, you'll have to wait until September before they arrive in the UK. The new Aquos X range will be available in sizes of 37, 42 and 46 inches. And get this, they measure only 34mm at their thickest point. Not quite as impressive as the 20mm prototypes that Sharp revealed at IFA last year, but pretty striking nonetheless. 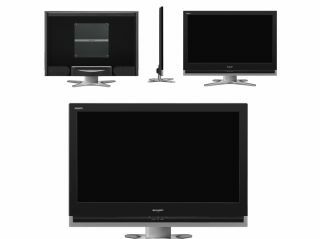 The range has recently launched in Japan and seems to have gone down well - Sharp is the major player in the Japanese LCD TV market after all. Improved image quality is provided by 120Hz frame rate conversion in combination with Full 1080p resolution. So that should eliminate most of the motion judder you might notice in fast moving pictures on your current LCD TV set. The dynamic contrast ratio is pretty solid too. The number of 15,000:1 is pretty meaningless in the scheme of things. But judging by the black levels on previous Sharp ranges, this 50 per cent improvement should make a significant difference. "Environmentally friendly design and a low electricity consumption of less than 0.5 watts in standby mode make the new AQUOS X series models the most eco-friendly in their class," says Sharp. The European Aquos X range from Sharp will debut at IFA in Berlin in September 2008. And as usual, we'll be there to let you know if they're worth the hype.